Matias Chilano returns to Tash's Movement Recordings with a new EP entitled 'Hypertrophy / Free Water'. The Argentinean artist last appeared on the Greek imprint in June of last year with an excellent remix of Dousk's 'Life Is A Carnival'. 2018 also yielded other notable projects including his 'Micron' EP (also courtesy of Movement Recordings) and a release on Cid Inc's Replug Records. 2019 holds promise with two of the Cordoba resident's tracks being selected by Patrice Baumel for his upcoming Global Underground Berlin compilation. 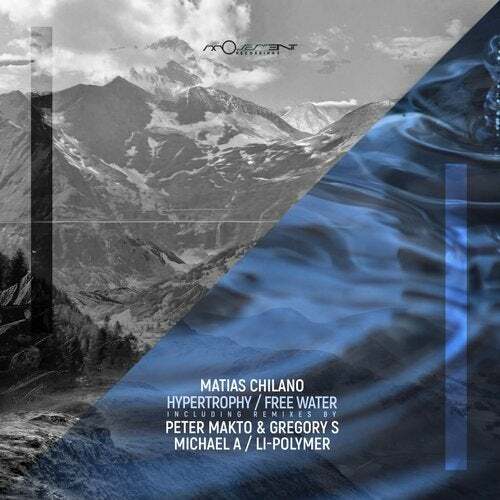 Now landing back on Movement Recordings, Matias presents his much anticipated 'Hypertrophy / Free Water' EP, alongside remixes from Michael A, Li-Polymer and Peter Makto and Gregory S.
Beginning with 'Hypertrophy' Matias explores the deeper spectrum of progressive minded house. It's warm, fluid groove is perfectly contoured, adorned with exotic percussion, glistening chimes and subtle shades and tones. A stunning melodic drift highlights the main break, veering into emotive territory, before it's atmospheric allure pulls you back into a meditative state for a spellbinding finale. The companion piece 'Free Water' moves closer to peak time territory with a robust, rolling groove, lively rhythms and waves of fiery percussion. Mysterious and mystical from the outset, the piece flows through indistinct vocal fragments and gaseous atmospheres, before warm overlays entice the narrative with emotive moments. The first interpretation of 'Hypertrophy' is provided by Michael A who returns to the label following his 'Another Way' EP from July of 2017. The Belarus based artist is beloved for his productions on Hernan Cattaneo's Sudbeat Music and Cid Inc's Replug Records. Now considered one of the scene's most consistent and also prolific producer's Michael continues a strong start to 2019 with a superb take on 'Hypertrophy'. Deep and driving, the groove commands a large presence as percussive flurries and astral effects adorn the framework. Evolving with a veteran's savvy, timely modulation provides waves of tonal tension while a backdrop of icy atmospheres lies in stark contrast. Granular drifts highlight the main break, delivering palpable tension before melting down to a sonic sizzle and powerful drop. The second and final interpretation of 'Hypertrophy' comes from Movement Recordings artist Li-Polymer. Also finding a home on Hernan Cattaneo's Sudbeat Music, the Portuguese producer had a strong 2018 with releases for Beat Boutique and ICONYC. Now returning to his comfortable home of Movement Recordings, Li-Polymer delivers a poignant take on 'Hypertrophy'. Exuding warmth, atmosphere and organic design, Li-Polymer's unique sonic blueprint carries you on an ever evolving seven minute journey. Drawing on the sensibilities from the original while adding delicate tonal themes and a flair for introspective reflection makes this a great complement to the previous two versions. the narrative during the main, perfectly setting the stage for an energetic finale. An inspired remix from the Hungarian duo which rounds out a welcome return to Movement Recordings for Matias Chilano, an artist who continues to operate at a creative peak.